The Duke of Northumberland met and presented trophies to the anglers who won the Northumbrian Anglers’ Federation. Thomas Gleghorn, winner of the James Hardy Memorial Trophy (biggest sea trout); John Johnstone, winner of the Centenary Cup (biggest trout). 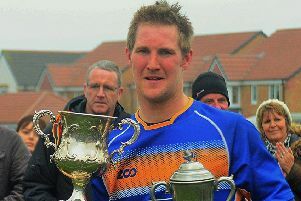 Unable to attend was Thomas Glenney, winner of the the Centenary Cup (biggest salmon). Contact details to buy Permits to fish the Federation’s waters can be found on the Federation website.